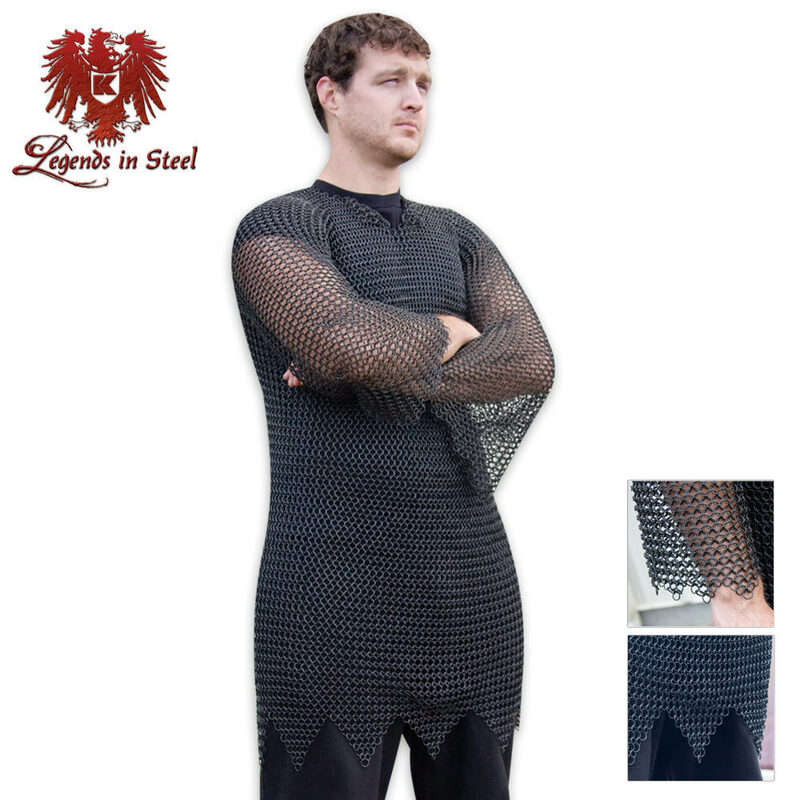 This battle ready medieval chainmail shirt is made of 18 gauge zinc-plated steel. The shirt is a mid-thigh length and the sleeves are full 19-inch sleeves. The rings are made of 18 gauge zinc-plated steel in the traditional 4-in-1 link pattern. It is the perfect piece for collectors and medieval reenactors alike. Just received my chainmail and I like it a lot however the neck hole was to small for my head, adjusted a couple of links and it fits like a heavy dream. Great especially for its value. It Heavy armor so it weighs around fifty pounds. I would of giving it 5 stars but their was an unclosed ring under the left armpit, I closed it up but if I had not realized this it could of caused the armor to fall apart. i continue to put it on as if it were not armor. i store mine in the towl i put it in after it arrived in the bag with a generous oil treatment. don't wear it over anything you don't intend to look for ways to remove the line of oil for the first several items you wear in close layer to it. you might want to purchase some Paracord to help fit it to your preferences.